These soft leather shoes maximize proprioceptive and tactile sensitivity of the foot relative to the surface you train on. This enables maximum strength and safety in grappling and weight training. Running and cross-training shoes are designed to reduce impact forces to the sole of the foot. In doing so, they inhibit the natural biomechanical functions of the foot and increase the risk of injury in resistance training. Raised heels cause unsafe stresses in the knee joint, raise your center of gravity, and impair effective foot function. Soles with foam, air or gel present significant dangers because they compress under the load of heavy lifts and destabilize the lifter. UGS don't have a raised heel or padded soles, permitting your feet to work naturally. They decrease the vertical distance of the pull when deadlifting and the sole traction enables controlled sliding for minor corrections in snatches and jerks. This makes UGS perfect for dynamic Circular Strength Training with Clubbells or Body-Flow. In grappling and training FlowFighting Systems, UGS provide a soft layer of protection against mat burn and prevent sprained toes. Due to hygiene concerns, UGS provide a great alternative to training barefoot in the gym, at home, or outside. SCOTT SONNON, US National Team Coach, and International Champion, designed the ULTIMATE GRAPPLING SHOES™ to meet the needs of the modern combat athlete!! His research into ergonomic training equipment to enhance combat performance created a revolution in combat training gear. Coach Sonnon's experience and research concluded that heavy soled shoes diminish sensitivity of the foot, which dis-inhibits the stretch reflex. The Positive Support Reaction is a reflex that causes the leg musculature to contract in response to pressure on the sole of the foot, which is a protective measure against loading. Heavy soled wrestling shoes for the purposes of submission and throwing creates deafness for kinesthetic sensitivity. Your feet cannot feel through the bulky ineffective technology. The restrictive padding prohibits the awareness of where and when to move to AVOID submission and to AVOID being thrown, but also, the traditional heavy soled wrestling shoes prohibits the awareness of when and where to move to CAUSE submission and to execute a throw. "COMFORT, DURABILITY, MOBILITY, FUNCTIONALITY," are the words that experts from all fields are describing this amazing new training technology. This revolution in martial art training equipment is SIGNIFICANTLY BETTER AND SAFER than wrestling shoes or barefoot training. It is singly the BEST equipment available and is an innovation that has never been available to the world. MARTIAL ART TRAINING IS A BIO-HAZARD! WRESTLING SHOES HAVE NO PLACE IN MARTIAL ART! Wrestling shoes were designed from wrestling, not the full out, hard edge, dynamic sphere of martial art combat sport. Submission wrestling, Sambo, Judo and Jiujitsu players will appreciate this training innovation because they do NOT restrict movement in the least, and actually increase it, while not limiting kinesthetic sensitivity. Quite a tall order and an absolute must for anyone that has been exposed to mat herpes, ringworm or the other host of bacterial and viral surfaces of martial art schools and wrestling mats. Forget about broken toes! Do you know of someone that has popped their knee trying JJ or Judo in wrestling shoes, due to that unforgiving hard rubber sole; with wrestling shoes, it's only a matter of time before you receive a crippling injury. Twist an ankle because it doesn't lend itself to the nuances of martial art, combat sport, or submission wrestling?? Lose a hold because you couldn't feel or move with that ankle armor of a wrestling shoe??? DON'T LOSE YOUR NEXT TOURNAMENT BECAUSE YOU WERE UNDER-EQUIPPED! MATCH TECHNOLOGY TO SPORTIVE STRATEGY! Wrestling shoes were designed for WRESTLING on a wrestling mat. When the exclusive goal is "pin" it behooves the player to have a sole and surface that have a combined HIGH friction coefficient - hence traditional wrestling shoes. However, strategy determines the technological support you must employ. If your emphasis is throw and submission, you'll need a significantly LOW friction coefficient between sole and surface. This is one of the reason why in Sambo in America, so many people, who insist on wearing traditional wrestling shoes, cause permanently debilitating injuries to their knees. 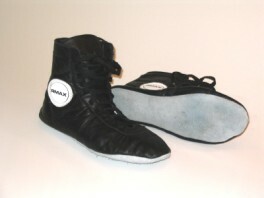 Traditional wrestling shoes PROHIBIT the rotational content of throws (twisting and turning). As they throw, the high friction coefficient between sole and surface prohibits the pivot, causing the first available joint to carry the pivot, sometimes the ankle, but mostly the knee. Their wrestling careers are over at that point, as they writhe in anguish from torn ligaments. 1. SAFETY - WS (Wrestling Shoes) are designed for Res-O-Lite type rubberized mats (to increase the friction coefficient between the surface of the mat and the sole of the shoe) for CONTROL - the general purpose of American folk style wrestling - strategic focus lies with speed and strength takedowns. UGS (Ultimate Grappling Shoes) are designed for "faster" surfaces (to decrease the friction coefficient between the surface of the mat and the sole of the shoe) for MOBILITY (since UGS have a unique all leather sole) - the general purpose of submission grappling such as Sambo, Judo, BJJ, MMA and NHB. The throws and movements of the later include rotational torsion on the ankles, knees and hips, that are not present in the former - the hard rubber soles of WS STICK to the mat since WS were designed for linear control, not rotational throws and takedowns. The technology of UGS was developed to eliminate the frequent injuries caused WS were used in submission grappling instead of wrestling tournaments. WS are a danger to submission grappling athletes. 2. MOBILITY - WS were created for STABILITY, UGS for MOBILITY of the ankle. The added padding of WS decreases range of motion and makes it easier for your opponents to apply ankle, knee and hip submissions. Having the "2nd Skin" of UGS, you have your natural flexibility, elasticity and range of motion in the ankle, knee and hip, which decreases the ease of your opponent's submission attempts. WS stability increases your opponent's submission success; where UGS mobility decreases your opponent's submission success.